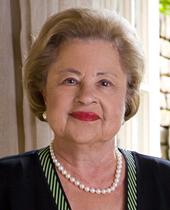 In October of 2005, at age 71, Flo Schornstein took the lead on a drive to raise funds for ReLeaf New Orleans, a re-greening initiative aimed at replacing many of the thousands of trees that Katrina had taken from the Crescent City. Flo knew that the landscape left by the storm would have a heavy impact on people already straining to imagine the futures of their old neighborhoods. She also knew that, in a city struggling to rebuild basic services, public funding to replant lost trees would not be available. But Flo Schornstein knows how to raise money… and she knows how to get the community involved. It’s what she does. Just look at the success of the Parkway Partners program – a public/private partnership that she created when she headed the City’s Department of Parks and Parkways. Flo created that program to get community members involved in caring for their green spaces. Through her leadership and fundraising efforts, Parkway Partners made improvements to public parks, created community gardens and developed an “adopt-a-neutral-ground” program. Re-Leaf is a branch of Parkway Partners – of which Flo remains development chair. So far ReLeaf‘s efforts can be seen in over 3,000 trees planted since the storm, including mass plantings on Broad, Elysian Fields, St. Claude and Lee Circle. Flo’s history with the city has given her the ability to see a better future for the city. To make that better future a reality, she is tapping a lifetime of fundraising experience to help raise money for ReLeaf. For Flo, age is irrelevant. When you’re helping others, there’s no time to think about aging. Flo is focused on continued achievement and growth. Just like the trees she’s helping to plant. Just like the communities she’s helping to revitalize. Flo Schornstein… Peoples Health Champion.